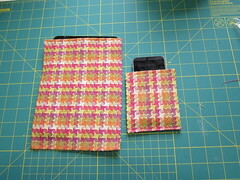 On Tuesday, I showed you how to make a quilted laptop sleeve using the lovely HGTV Home fabrics from Jo-Ann. Today, we’ll make the matching tote bag that holds it. 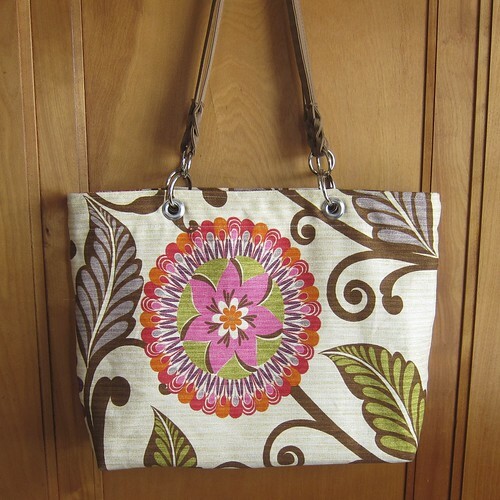 This tote bag is lined with the same fabric I made the laptop sleeve with bright cheerful flowers on the outside. 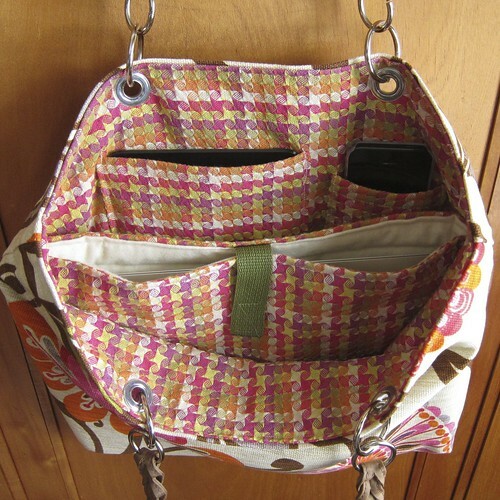 I made this one a total electronics bag and added pockets to fit an iPhone and Ipad mini. Of course, you can just make the tote and use it to hold whatever you want too. 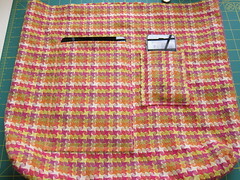 A very stiff interfacing at the bottom helps the bag keep it’s shape even when full. I finished the bag off with straps that I also found at Jo-Ann. I love the way they look compared to straps just sewn from fabric or webbing (though they were a little tricky to attach). This bag is for my cousin Jenny and I think it’ll be perfect for her when she travels. 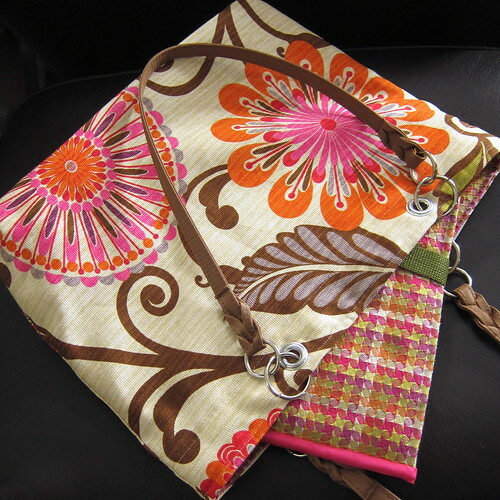 The laptop sleeve and tote bag are made to fit a 13″ Macbook Air or Macbook Pro. You can adjust the sizes to fit your particular computer. Use a 1/2″ seam allowance unless otherwise noted. 1. Cut your fabric to the specifications in the supplies list. Since my outer fabric has such a big pattern I was glad I had a yard to play with. I was able to cut the pieces in order to show off whole flowers on the front and back of the bag instead of just getting little bits. 2. Pin the outer pieces together right sides facing. Sew along the two long sides and one short side. This will be your bottom and sides. 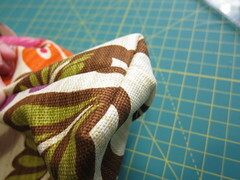 Repeat with the inner fabric but sew a 5/8″ seam allowance. 3. Now you will make gussets at the bottom corners of both the outer and inner pieces. 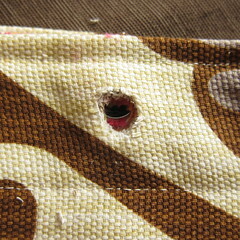 At each corner make a triangle, lining the bottom seam up with the side seam. I pin it together at the seam. Do not open your seam allowances just fold them to one side. Measure down to where the triangle is 3″ across the bottom with the seam in the middle. Mark that line and sew across it. This will square off the bottom of your bag. 4. Cut a piece of the interfacing the size of the bottom of the outer piece. 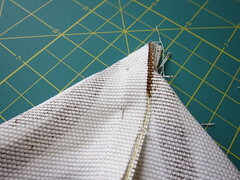 My interfacing was sew-in so I sewing it in place along the bottom seam of the outer piece. If you use iron-on you can just iron it in. You can use multiple laters for an even stronger bottom. You can do this before you sew your inner piece together as well. I just wanted to place mine on the sewn piece. 6. Fold both pieces in towards their wrong sides 2.5″. Place the inner piece inside the outer piece with the wrong sides together. Pin in place. Topstitch along the top of the bag, then stitch again 2″ down. 7. Decide where you want your grommets at the top of the bag. Mine are 3.5″ from the center (7″ from each other). 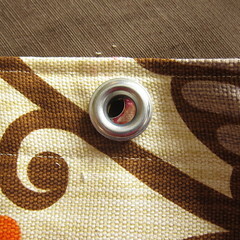 Use the front of the grommet to mark the hole you need to cut for it. Carefully cut out the hole. I found an exacto knife and embroidery scissors helped with this. I cut through one layer at a time. It is best to start small an make the hole bigger if you need to. You want the grommet to just fit in the hole. Follow the instructions on your grommet tool to secure the grommets. 8. 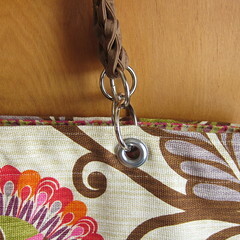 Open a ring and put it through the grommet and the end of the purse strap (my straps also had rings on the ends). Close the rings. These rings were so hard to open. My husband had to help me and we couldn’t get the rings on the straps themselves open at all. My backup plan was to make fabric loops that went through the grommets and the rings on the straps. 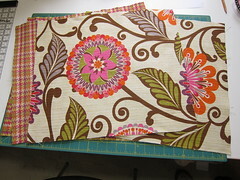 Like the fabric I used? Here’s a coupon so you can get 10% off of them or any other HGTV Home fabric through May 4th. Both of these are amazing. You did such a good job! Wow, this project rocks! LOVE it! I love how you matched the inner fabric to the laptop sleeve, so it all matches inside the bag. Instead of interfacing, I usually use plastic canvas (the kind of thing sold for kids to learn cross stitch on) as the stiffener at the bottom of a bag. 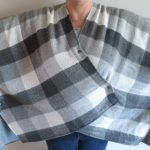 You can either slip it between the outer and inner fabrics and tack it to the seam allowance, or you can cover it with fabric and have it as a removable base that you just slip in to the finished bag. I’ve done the same thing a lot of times too. 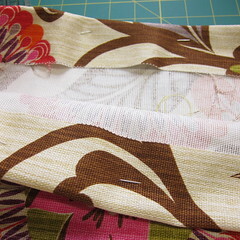 I happened to have this very firm interfacing from another project, so used it. Sure glad to find your bag idea. I just got a new laptop and didn’t want to pay big bucks for the “envelope” so was trolling in my sewing supplies to see how I could make it. This nailed it down with a few adjustments. I was making for a 17″ unit so had to increase it I added a flap to the envelope to fold over; I cut only one piece that was double length so I have only one seam up and down. Used the plastic canvas as mention for the bottom, interfaced the inside one for strength and use one longer piece for the pockets and sewed at various places to make individual pockets. Couldn’t find the handle I wanted so just used regular webbing. I don’t travel a lot but when I do now I have a great carrying case for the electronics stuff. Thanks again for your idea. to make the bag…Is there a way to copy ? Phyllis – I think you are asking how to print the instructions. The best way is to just copy the instructions and paste them into a word doc. Hi, where can I get straps like the ones you used? Mine were from Joann Fabric. You can also find tons of purse straps on Etsy. I sure hope you can help me!?! I love this tote! Where can I find the complete pattern, including the quilted laptop sleeve pattern? Do you have other patterns available? I would love to add some of your talent to my ever growing pattern collection so just let me know where to purchase the pattern if available!